Boveda spanish cedar holders sold separately. Please Note: Do not mix Boveda RH levels within the same humidor, and do not use Boveda in the same humidor with other humidification products. They will fight against each other and reduce the efficiency of the Boveda. Why shouldn’t I use Boveda with other humidification devices? 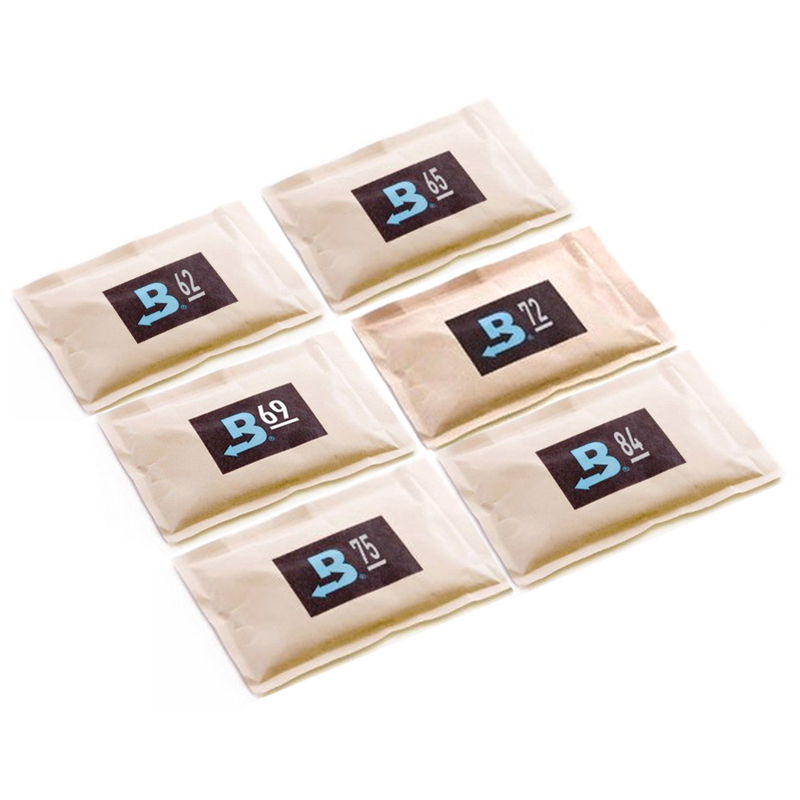 Boveda was designed as a stand-alone 2-way moisture control. When you introduce a wet sponge, crystal, gel or beads, Boveda is absorbing the very high humidity given off by these 1-way humidification devices, giving you mixed results. Just use at least one Boveda per 25 cigar capacity for perfect and predictably precise results. When do I know when they need to be replaced? All Boveda will turn into a solid wafer when they’re dead. So it’s short of that, when there aren’t many soft spots left, that you’ll want to replace them. Pronounced crystallization and hardening of the corners first is completely normal. What humidity level do I need? Boveda is available in 62, 65, 69, 72, 75 and 84 (exclusively for seasoning). 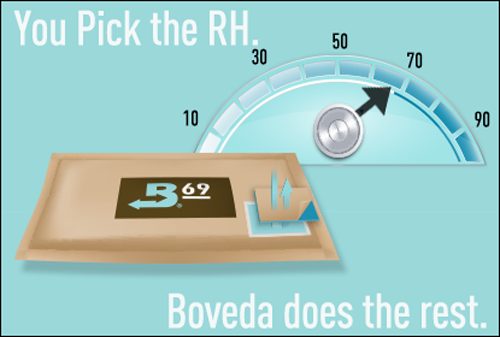 All Boveda are accurate to +/- 1% of the RH printed on the pack in an air-tight environment. Humidors are not air tight. Depending on humidor quality and ambient conditions, it’s not uncommon for the actual RH to be stable anywhere from 2-6 points below the Boveda RH you’ve chosen. This is why we recommend 72% for your first set after seasoning. If it’s 72 on the nose, you’re perfect. If it drops a few points, you’re still perfect. Based on how your humidor performs, you can decide whether to move to 62, 65, 69 or 75. I’ve been using my humidor for a while, do I need to re-season? A. If an accurate hygrometer (calibrate it with our calibration kit) tells you you’re 60% or less, re-season it with our 84% Boveda. While the humidor is re-seasoning, REMOVE all cigars, put them in Tupperware with 69 or 72% and they’ll be perfect while your humidor conditions. It MAY NOT take the usual 14 days to season, since you’re starting somewhere in the middle. Calibrate your hygro with our calibration kit and only leave the 84% in (1 per 25 cigars the humidor holds) until the RH inside reaches 68-72%. B. If an accurate hygrometer (calibrate it with our calibration kit) tells you it’s 60% RH or more, just use the 1 Boveda per 25 cigars it holds in 72%. This way, the 72's are doing the rest of the seasoning while caring for your cigars and keep you at a safe RH once it’s finished. NOTE: Because the Boveda are essentially seasoning while caring for the cigars, they’re working double hard. So the first set of Boveda will not last as long as subsequent sets will. C. If you haven’t calibrated your hygrometer with our kit, you can never be certain what’s happening in your humidor or how to fix it. Hygrometers are imprecise and require calibration. With our one step kit, you’ll know the accuracy of your hygrometer in 24 hours. Do I use Boveda along with sponge/crytals/gel/beads? No, throw them out. They’re only reservoirs for holding water and only give off 100% humidity – despite their claims. Those items give off flavors and films that keep you from enjoying your cigars the way the master blender intended.